A song cycle in classical music is a group of songs that belong together. Although each song may be sung separately, the composer really imagined that they would be performed together as one work. Sometimes they tell a story, but sometimes they just belong together because they are about the same idea (e.g. the sadness that can be caused by love). They are often for solo voice and piano accompaniment, but they can also be without accompaniment, or with several instruments or even a whole orchestra. The words of a cycle are often by the same poet, but this is not always the case. Song cycles started to become popular with composers in the Romantic period. Although there were examples of song cycles written before that, it was the German composers of the 19th century who are most often thought of as writers of song cycles. Their songs are called "Lieder". 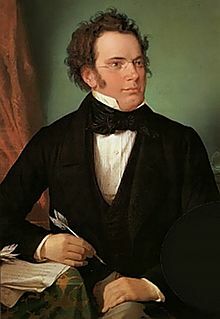 The great composer Franz Schubert wrote about 600 songs. These include two long song cycles: Winterreise (Winter’s Journey) and Die schöne Müllerin (The beautiful miller’s daughter). Each of these song cycles is long enough for a whole concert. Robert Schumann wrote song cycles including two which he simply called Liederkreise (Song Cycles), and his well-known Dichterliebe (Poet’s Love) and Frauenliebe und -Leben (Women’s Love and Life). Brahms wrote Vier ernste Gesänge (Four Serious Songs), and Gustav Mahler, who became very interested in folk song, wrote several song cycles with orchestra accompaniment, including Das Lied von der Erde (The Song of the Earth). French composers who wrote song cycles include Jules Massenet, Gabriel Fauré and Claude Debussy. Russian composers include Modest Mussorgsky and Dmitri Shostakovich, and English and American composers in the 20th century include Michael Tippett, Benjamin Britten and Aaron Copland as well as the South American Alberto Ginastera, Juan María Solare and Heitor Villa-Lobos. Song cycle Facts for Kids. Kiddle Encyclopedia.